Since it is only the front brakes, I question the master cylinder. Try this. When the brakes are locked up, see if they release if you open the brake line at the master cylinder. If it doesn't, work forward. Move to the caliper. Open the bleeder and see if the brake releases. I have seen situations where the rubber brake hose on the calipers would fail internally causing the brake pads to remain partially actuated or fully. When driving, there would be enough drag on the brakes to cause them to get hot. Now, brake fluid expands when it is hot, so the brakes would slowly continue to engage. If the brakes release when you open the bleeder on the caliper, replace the rubber brake hose. I would say it's got to be something in the electronics of the master cylinder is working fine. It's releasing but the traction control light keeps coming on. If you turn it sharp right or left or if the brake locks up. It'll flash on and then flash off, so it's got to be something in the ABS. I just don't know. I didn't realize turning caused this problem. With that in mind, the first thing I would check are the ABS sensors on the front wheels. Check to confirm the wiring isn't damaged, shorted, or not properly plugged in at the connector. I attached pictures of where the wiring mounts and sensor location. Check both sides. Also, based on the year, I strongly recommend scanning the computer for diagnostic trouble codes. Turning never caused this problem, it just started when I turn it it acts like it's shaking. Are you sure the brakes aren't hanging up a bit all the time? I forwarded this to the owner for his ideas or suggestions. Expect a response from Ken. I will continue watching what is happening and try to help. 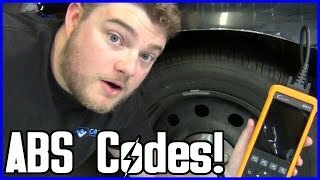 If the module is to blame this video with show you how to replace it with instruction and diagram below to help show you on your truck. ABS traction control module replacement reprogramming. Stable battery voltage is critical during programming. Any fluctuation, spiking, over voltage or loss of voltage will interrupt programming. When required install the EL-49642 - SPS Programming Support Tool to maintain system voltage. If not available, connect a fully charged 12?V jumper or booster pack disconnected from the AC voltage supply. DO NOT connect a battery charger. Clear DTCs after programming is complete. Clearing powertrain DTCs will set the Inspection-Maintenance (I-M) system status indicators to NO. Install EL-49642 - SPS Programming Support Tool . On the SPS Supported Controllers screen, select K17?Electronic Brake Control Module - Programming and follow the on-screen instructions. On the SPS Supported Controllers screen, select K17?Electronic Brake Control Module - Configuration and Setup while following the on-screen instructions. At the end of programming, choose the Clear All DTCs function on the SPS screen. Perform the Diagnostic Repair Verification after completing the repair. Like JACOBANDNICKOLAS said it could be a bearing hub going out causing the wheel speed sensor to have a false reading. Found the problem and it was not showing up on the scanner. We've changed the brake booster the air component that went to the booster the brake lines the master cylinder. Could not find anything wrong it was not showing on the scanner the codes weren't there we were changing these parts one at a time and it was still doing the same issues. The first thing we changed was the booster then it showed up it wasn't getting enough air to the booster so we change that component then we change the brake lines then we changed the master cylinder. We were perplexed and could not find the issue we had two other mechanics looking at it. One of them and told us that sometimes the boosters can be bad even though it was from GM and come right out of the box we went back to that we changed and put a new booster on that was the problem. Thank you for everyone helping with this. We just found the problem yesterday we've been two weeks working on this. Happy to help. What was the actual problem? I'm sure it will help someone in the future. We change the brake booster, the pump, the brake lines, and the master cylinder. The new brake booster we put in from GM was bad. Wow! You buy the best and this happens. However, I guess it can happen. Regardless, I'm glad it's fixed. Take care and let us know if you have questions in the future. Thank you and everyone else. Happy to help. And I can't believe I missed your identifying the problem in your prior post. Sorry about that. I Changed The Electronic Brake Control Module And Now The Brake Lite And Abs Lite Stay On. How Can I Get Them To Go Off?